Chelsea's incoming manager Antonio Conte is one of the best in the game alongside Jose Mourinho and Pep Guardiola, says Gianfranco Zola. 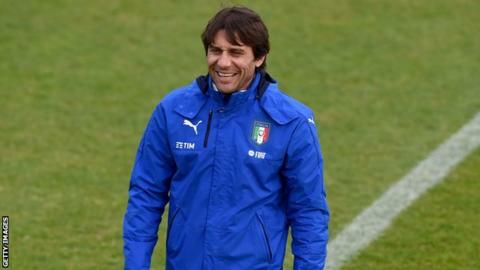 Italy boss Conte will take over at Stamford Bridge after Euro 2016, replacing interim coach Guus Hiddink. The 46-year-old won the Serie A title in each of his three years as Juventus boss between 2011 and 2014. "He's done so well in Italy that he has to be considered the same level as Guardiola and Mourinho," Zola said. "He has not won as much internationally but he is a good coach with a strong personality. I'm sure he will bring a lot to Chelsea," the former Blues striker told World Football on the BBC World Service. Another former Chelsea player, Chris Sutton, had questioned Conte's appointment, describing him as too similar to Mourinho, who was sacked by the club in December amid suggestions he had fallen out with several senior players. But the only problem Zola could envisage was a potential difficulty in attracting new players without Champions League football next season, although he went on to say even that may turn into a positive. "Antonio as a coach is very disciplined, he demands a lot from the side no matter who you are and also tactically he works a lot," he added. "There might be a problem bringing big players because playing in the Champions League is a big issue, but that actually could be an advantage because there won't be as much pressure on him. He will do well with Chelsea, I am sure." An Italian court is yet to reach a verdict over Conte's alleged role in a match-fixing case. On Tuesday a prosecutor called for Conte, who denies wrongdoing, to be given a six-month suspended prison sentence over his alleged role in the case, which focuses on his time in charge of Siena in 2011.